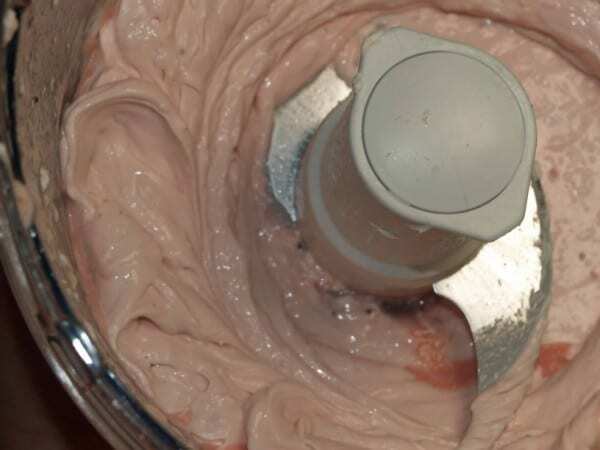 Strawberry Cream Cheese like Philadelphia brand is just as sweet and fruity as the regular brand, but this you can make in your kitchen. Bagels for breakfast are one of my favorite types of breakfast. 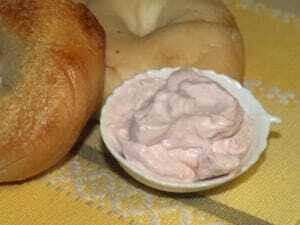 One thing I enjoy from the bagel places is the wonderful cream cheese spreads they have available. When made fresh they seem to have a flavor that is free from additives, and your cream cheese spreads so nicely over your bagel. While, I should say I also adore lox, capers, and thinly sliced red onions on my bagel, sometimes I want something sweet. This is just a start, you could add some of your favorite liqueur into this, two tablespoons of Chambord, and a touch of orange zest gives you a spectacular cream cheese spread. Now I have shared my two favorite ways of having bagels for breakfast (lox and other goodies, and something sweet), what is your favorite way to have your bagel? Learn more about the Bagel. A short history on the bagel. Make a flavored cream cheese just like you can buy in the store. Carefully drain off about 1/3 to 1/2 cup of the juice from the frozen strawberries. You will not need the strawberries for this recipe. You could make another recipe from the strawberries like the Red Robin Strawberry Lemon Aide. Cut cream cheese into large cubes, add cubes of cream cheese into the bowl of your food processor. Drizzle strawberry liquid over the cream cheese. 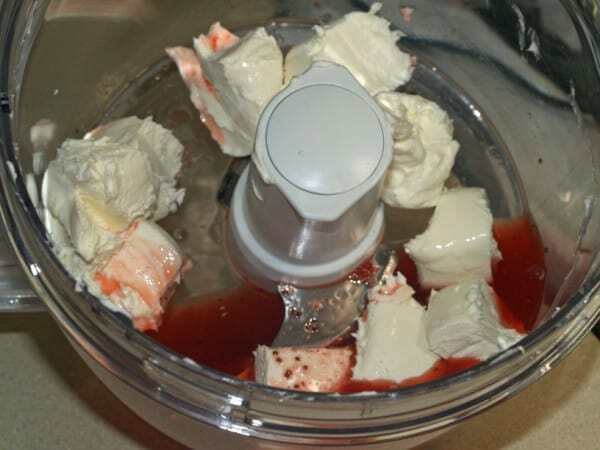 Pulse the cream cheese and strawberry liquid until well mixed. You’re so right, every once in a while something sweet on a bagel is wonderful. I’ve always used all the fruit in a cream cheese spread, but using just the juice like that certainly makes it much smoother and creamy. Great idea, thanks! I am loving your blog, so many great recipes. Come over to GrannyMountain for a visit when you have the time!